A Joseph Youseff strike nine minutes from time has helped Pascoe Vale return to the winners list. The solitary strike from Youseff was enough for the visitors to overcome Werribee City on a cold and blustery afternoon at Galvin Park. The home side will be ruing its missed opportunities throughout the first period, with Pascoe Vale largely outplayed by a Werribee City team who looked calm and composed going forward. Indeed the majority of chances in the opening period fell to the Bees, with Christopher Cristaldo often the architect. Milan Savic was guilty of spurning a glorious chance from a Cristaldo free kick, with his header agonosilinly drifting over the bar. Pascoe Vale was struggling to deal with balls from wide areas; both Ryan Flipovic and Steven Cudrig were next to test Stefaan Sardelic, but Sardelic was brilliant in denying both. The visitors looked much more assured in the second period; Davey Van’t Schip almost had the visitors in front after some great work in the final third by Michael Ferrante but Van’t Schip saw his strike go wide. The introduction of 16-year-old Matthew Conversano, in only his second senior appearance, proved a telling point of the match. Conversano was pivotal in setting the ball to Youssef, whose low strike beat an oustretched Frano Saric. Werribee sent Steven Cudrig and Ryan Filipovic forward for the last 10 minutes, adopting a more direct approach as the clock began to count down. Filipovic almost found a way through the Pascoe Vale defence late on; his strike from the edge of the area had Sardelic beaten but the strike whistled just past the post. 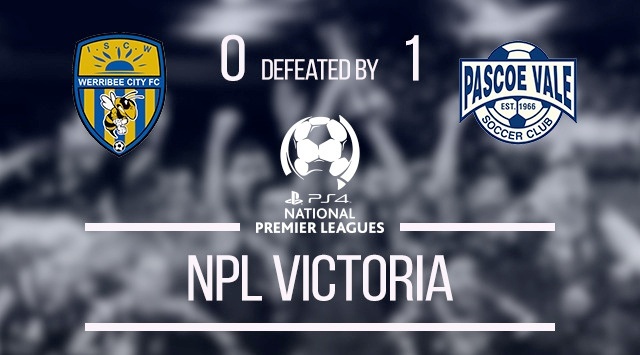 Pascoe Vale had a late chance to seal it when Youseff broke clear in injury time, but the strike went wide.